This book offers a comparison of the animal rights movements in the US and France, drawing on ethnographic and interview material gathered amongst activists in both countries. Investigating the ways in which culture affects the outcomes of the two movements, the author examines its role as a constraining and enabling structure in both contexts, showing how cultural beliefs, values, and practices at the international, national, and organizational levels shape the strategic and tactical choices available to activists, and shedding light on the reasons for which activists make the choices that they do. With attention to the different emphases placed by the respective movements on ideological purity and pragmatism, this volume provides an account of why their achievements differ in spite of their shared ultimate goals, offering policy recommendations and suggestions for activists working in a variety of cultures. 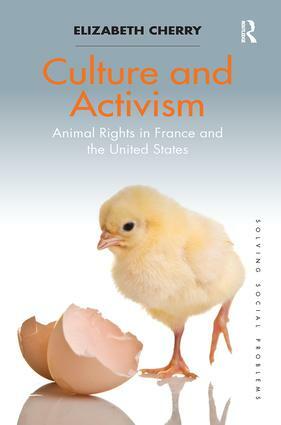 Informed by the work of Giddens and Bourdieu, Culture and Activism: Animal Rights in France and the United States constitutes an empirically grounded, comparative study of activism that will appeal to scholars of sociology, anthropology, political science, and cultural geography with interests in social movements and social problems. Elizabeth Cherry is Associate Professor in the Department of Sociology and Anthropology at Manhattanville College, USA. Solving Social Problems provides a forum for the description and measurement of social problems, with a keen focus on the concrete remedies proposed for their solution. The series takes an international perspective, exploring social problems in various parts of the world, with the central concern being always their possible remedy. As such, work is welcomed on subjects as diverse as environmental damage, terrorism, economic disparities and economic devastation, poverty, inequalities, domestic assaults and sexual abuse, health care, natural disasters, labour inequality, animal abuse, crime, and mental illness and its treatment. In addition to recommending solutions to social problems, the books in this series are theoretically sophisticated, exploring previous discussions of the issues in question, examining other attempts to resolve them, and adopting and discussing methodologies that are commonly used to measure social problems. Proposed solutions may be framed as changes in policy, practice, or more broadly, social change and social movement. Solutions may be reflective of ideology, but are always pragmatic and detailed, explaining the means by which the suggested solutions might be achieved. To submit a proposal for the series, please contact the series editor at berry@anomie.com.